The authors share some insights about their Original Article “EUS-guided coil versus cyanoacrylate therapy for the treatment of gastric varices: a multicenter study (with videos)” from the November issue. Authors of this paper include Rafael Romero-Castro, MD, PhD,* Mark Ellrichmann, MD,* Carlos Ortiz-Moyano, MD, PhD, Jose Carlos Subtil-Inigo, MD, PhD, Felix Junquera-Florez, MD, Joan B. Gornals, MD, Alejandro Repiso-Ortega, MD, Juan Vila-Costas, MD, PhD, Francisco Marcos-Sanchez, MD, Miguel Muñoz-Navas, MD, PhD, Manuel Romero-Gomez, MD, Prof, PhD, Enric Brullet-Benedi, MD, Javier Romero-Vazquez, MD, Angel Caunedo-Alvarez, MD, Francisco Pellicer-Bautista, MD, PhD, Juan M. Herrerias-Gutierrez, MD, Prof, PhD, and Annette Fritscher-Ravens, MD, Prof, PhD. *Drs. Romero-Castro and Ellrichmann contributed equally to this article. Therapy of gastric varices (GV) is still challenging. Cyanoacrylate (CYA) injection is the recommended treatment for bleeding GV, but has a known adverse event rate, including deaths, which could be reduced if EUS is used for guidance. Otherwise, EUS-guided coil application (ECA) may offer an alternative. We recently performed two pilot studies using EUS-guidance for CYA injection and also coil deployment into the afferent feeding veins of type I localized GV, not anastomotic varices, to evaluate whether some of these problems could be avoided. The aim of the study was to compare EUS-guided injection of CYA and ECA embolization of feeding vessels of GV, not ectopic varices, for feasibility, safety, and applicability in a retrospective analysis of a prospectively maintained database. This multicenter study found EUS-guided therapy of GV by injecting cyanoacrylate or delivering coils feasible, accurate and reproducible. One advantage of EUS-guidance for the injection of CYA is the selective targeting and puncture where the perforating vein enters the muscular layer of the gut wall, where the vein is compressed by the gastric wall. This specific location allows obstructing the high speed flow with little volume of CYA, as well fewer coils. Moreover, injection into the gastric wall is avoided, preventing further ulceration and severe adverse events. Besides, endoscopic view is not needed. Standard endoscopic techniques inject “blindly” larger amounts of CYA. This is the first study that directly compared the new ECA with EUS-guided CYA injection in localized type I GV. ECA is feasible and safe, although technically more demanding. 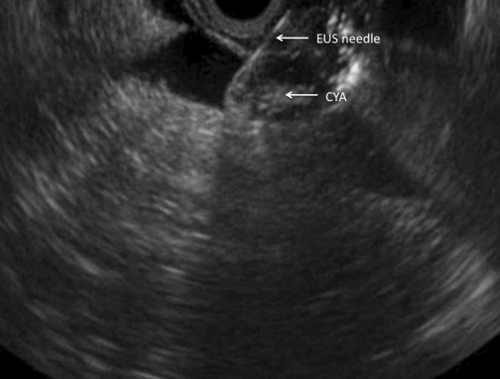 Sharing personal experiences and knowledge gathered in the published literature could lead to display on EUS the complex vascular anatomy of GV by focused endosonographers making the procedure reproducible and probably more accurate and safer. It has to have in mind the risks of EUS-guided angiotherapy, mainly, hemorrhage and infection. Therefore, the procedure have to be performed by experienced endosonographers with all the devices, facilities and personnel available, without sparing anything that could be useful and could increase the safety and the accuracy of the procedure, as the fluoroscopy guidance. We are also needed for both, instruments and tailored devices that could make the procedure easier, safer and quicker. Nowadays, we think that the free-hands endoscopic injection of cyanoacrylate is yet the first method in the emergency setting if EUS-angiotherapy cannot be provided, leaving the EUS-guided or radiological procedures for an elective procedure aiming to achieve the GV obliteration with the less risks as possible, including patients without previous bleeding but at risk. As this study represents the first comparison of EUS-guided techniques, further prospective controlled studies are necessary to establish which technique should be first employed in the treatment of GV, taking into account our findings of an unexpected high rate of pulmonary glue embolisms, although asymptomatic. Read this article on pages 711-721 of the print journal or find it online.